Former Defense Minister, member of the Republican Party of Armenia Vigen Sargsyan has said that the RPA has to run in the upcoming parliamentary elections on December 9. “This way, the accomplished political party will not scowl at the people, but will instead submit a fresh application to serve them in new capacity,” Sargsyan said in a Facebook post. “Being opposition is neither a privilege, nor an administrative lever, nor a high public position. “It’s an honorable opportunity to repent for your mistakes." According to him, the party which was at the helm of the country for many years has no right to “wash its hands” of public life and take its experience, knowledge and skilled team away. 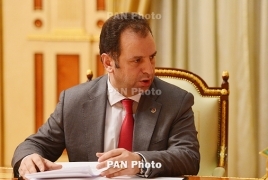 Election campaigns ahead of Armenia's snap parliamentary vote of December 9 will begin on November 26.